The garage is often thought of as a purely utilitarian space. Basically, it’s just a place to park and protect your vehicle. Perhaps you have a workbench and maybe a dartboard in your garage. Some of you might even have a few posters gathering dust in your garage. Whereas the garage used to be an overlooked area of the home and was ignored when making improvements, things have been changing as of late. Your garage holds the potential to provide so much more. There are many opportunities to make upgrades to your garage. You can take that drab space and give it color and character. 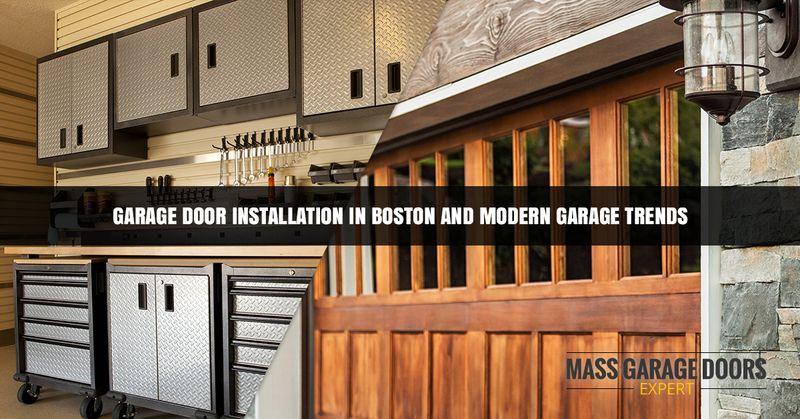 Mass Garage Doors, your garage door installation service in Boston, offers garage trends for homeowners. If you are like many homeowners, you use smart home technology in the form of smart thermostats, security cameras and speakers. These are devices that can be operated through apps on your smartphone, tablet or laptop. They are rising in popularity because of their convenience. Smart technology is also available in the garage. Nowadays, you can monitor and operate your garage door from anywhere with your smartphone and an app. Hybrid and electric vehicles are becoming more popular and more affordable, which means you might own one in the future. The batteries in electric vehicles are greatly improved and a full battery charge will provide a long distance driving experience. However, you still need to plug your car in to charge the battery. If you own an electric vehicle, a charging station in your garage is a must. And since electric cars are becoming more popular, charging stations in garages will become more common. Long gone are the days when all garage doors looked alike. Homeowners today are opting for fancy garage doors. Some homeowners will opt for a garage door with windows while others will have a crafted wood garage door. Another modern garage trend addresses the flooring. Many homeowners take their floors for granted and have never given it a second thought. Today’s homeowners have options when it comes to their garage floors. For example, you can choose from several garage floor coverings including plastic tiles, wood composite tiles and rubber tiles in a variety of styles and colors. You could also utilize a garage floor coating that will change the look of your garage and protect it from oil, grease and chemicals. Because modern garages can be designed to look better and function better, homeowners desire to spend more time in them. Garage workshops are all the rage and will give your garage even more functionality. If you have room, your garage is the perfect space for creating a workshop that enables you to divulge in repairs, your passion for woodworking or just general tinkering. Finding better ways to add storage space in your garage is a trend that never goes out of style. No matter how modern your garage might be, call Mass Garage Doors when you need garage door installation.